Scratched exhaust - how to touch up? 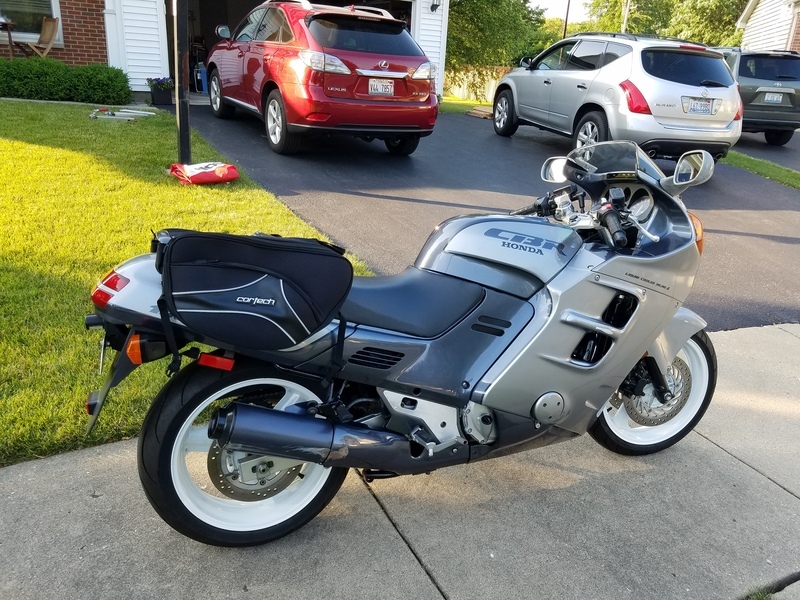 I just bought a 1990, and one of the reasons that I was able to wrestle it out of the original owner's hands with 7k miles on it is he dropped it (and got scared, I think) and the right side exhaust is scratched and lightly dented. So what do you guys use to touch up scratches on an exhaust? It's the black exhaust. Here's a photo....makes me SICK how clean the rest of the bike is. That's a pretty rough scratch. You could paint it so it's less noticeable. Yeah, it's pretty rough. I would just want to paint it so it's less noticable. Not really interested in the expense of replacing it. What type of paint have others used successfully on these exhausts? How deep do you want to get in painting it? You could remove it and have it coated by someone who coats exhaust parts, but that will be pricey I'd bet. You could spray paint it using engine paint, radiator paint, BBQ paint, or some other paint that can take the heat. Yeah, I'm thinking just some high temp paint.....was looking for suggestions. I guess any of them rated for high temps will work? Quick Reply: Scratched exhaust - how to touch up?